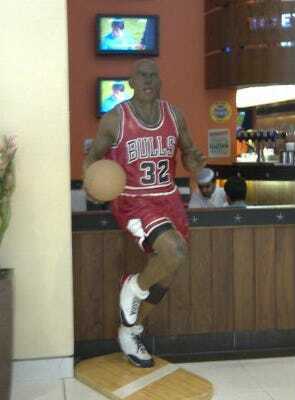 A sports grill at the Dubai Mall built a statue of Michael Jordan. That’s not much of a surprise, considering the NBA’s surging popularity in even the most remote locations abroad.What’s surprising is for all the detail the statue has right – check out MJ’s kicks – it got the most basic thing wrong: his legendary No. 23 jersey. Instead, the sports grill has him donning the number 32 jersey longtime teammate Will Perdue wore. Check out the picture at right, courtesy of Complex (via SportsGrid). Perhaps we shouldn’t be surprised: it’s not the first time Dubai has made a mistake with a major American sports star.